↑ McMahon, Suzanne. "Overview of the South Asian Diaspora". University of California, Berkeley. สืบค้นเมื่อ 2008-04-23. ↑ Ramamoorthy, L. Multilingualism and Second Language Acquisition and Learning in Pondicherry. Retrieved on 2007-08-16. ↑ Sunwani, Vijay K. Amazing Andamans and North-East India: A Panoramic View of States, Societies and Cultures. Retrieved on 2007-08-16. ↑ BBC. India sets up classical languages. August 17, 2004. Retrieved on 2007-08-16. ↑ The Hindu. 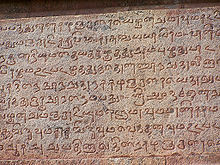 Sanskrit to be declared classical language. October 28, 2005. Retrieved on 2007-08-16. ↑ Harold Schiffman, "Diglossia as a Sociolinguistic Situation", in Florian Coulmas (ed. ), The Handbook of Sociolinguistics. London: Basil Blackwell, Ltd., 1997 at pp. 205 et seq. ↑ Harold Schiffman, "Standardization or restandardization: The case for ‘Standard' Spoken Tamil". Language in Society 27 (1998), pp. 359–385. ↑ V. S. Rajam. "A Reference Grammar of Classical Tamil Poetry: 150 B.C.-Pre-Fifth/Sixth Century A.D." สืบค้นเมื่อ 2007-06-01. ↑ Krishnamurti, Bhadriraju (2003). The Dravidian Languages. Cambridge Language Surveys. Cambridge University Press. p. 154. ISBN 0521771110.